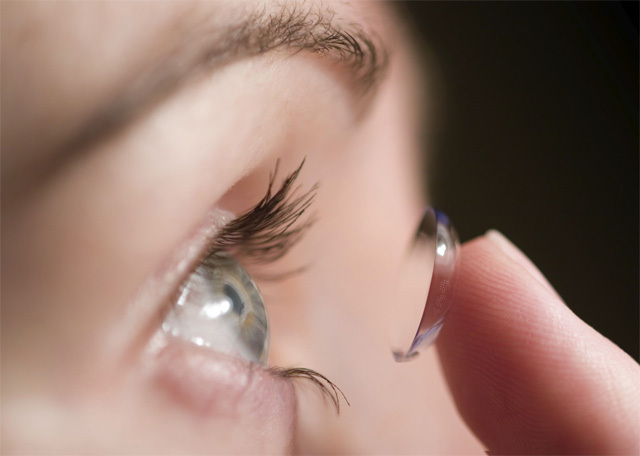 Researchers from San Diego and Switzerland have created contact lenses which, when paired with special spectacles, bestow telescopic vision on their wearers. 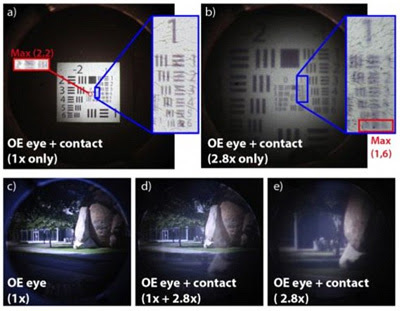 The contact-lens-and-spectacles combination magnifies scene details by 2.8 times. Polarising filters in the spectacles allow wearers to switch between normal and telescopic vision. The telescopic sight system has been developed to help people suffering age-related blindness. For their filtering system, the researchers, led by Joseph Ford at UC San Diego and Eric Tremblay at Switzerland's EPFL, adapted a pair of glasses that Samsung produces for some of its 3D TV sets. In normal use, these spectacles create a 3D effect by alternately blocking the right or left lens. The prototype contact lens produced by the team is 8mm in diameter, 1mm thick at its centre and 1.17mm thick in its magnifying ring. The most difficult part of the project was making the lens breathable," Dr Tremblay told the BBC. "If you want to wear the lens for more than 30 minutes you need to make it breathable. Gases have to be able to penetrate the lens to keep the parts of the eye covered by the contact, especially the cornea, supplied with oxygen, he said. The team has solved this problem by producing lenses riddled with tiny channels that let oxygen flow through. However, said Dr Tremblay, this made manufacturing the lenses much more difficult. "The fabrication tolerances are quite challenging because everything has to be so precise," he said. "They are not so concerned about macular degeneration," he said. "They are concerned with super vision which is a much harder problem. "That's because the standard is much higher if you are trying to improve vision rather than helping someone whose eyesight has deteriorated," he said.